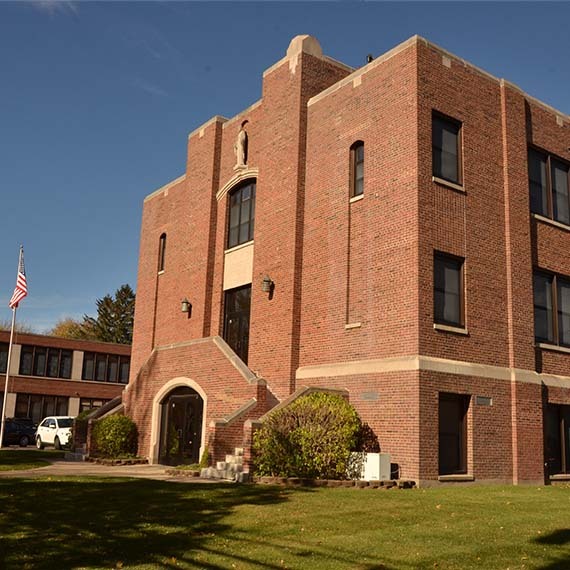 Welcome to Queen of the Miraculous Medal School in Jackson, where you will find a strong family tradition of Catholic education since 1941. We are dedicated to helping children in preschool through 6th grade develop their full academic, spiritual and social potential. We accomplish this with rigorous academic programs, exciting extracurricular offerings and, most importantly, by encouraging students to grow in faith. In addition, we have a dedicated teaching staff and many parents and grandparents involved in our school. If you are looking for a place where your student can feel like part of a family, while experiencing a top-notch education and growth in their spiritual life, you will find it here. Our mission is to assist parents in their primary role as educators of their children. Through a well-rounded curriculum integrated with the message of Jesus Christ, Queen of the Miraculous Medal School strives to develop Christian people who will use their unique talents and gifts to recognize their own goodness in God, experience the family that is our parish, and seek social justice in the global community affirming the presence of Christ in all people. Academic excellence at Queen of the Miraculous Medal begins with our highly qualified and dedicated teaching staff. Students at Queen of the Miraculous Medal are held to high academic expectations. Our curriculum is based on the Jackson Area Catholic Schools Curriculum, which integrates the Diocese of Lansing standards and local, state and national standards. Along with our core offerings in religion, reading, English, science, social studies, mathematics and handwriting, we also have music, art, library, Spanish, technology and physical education. 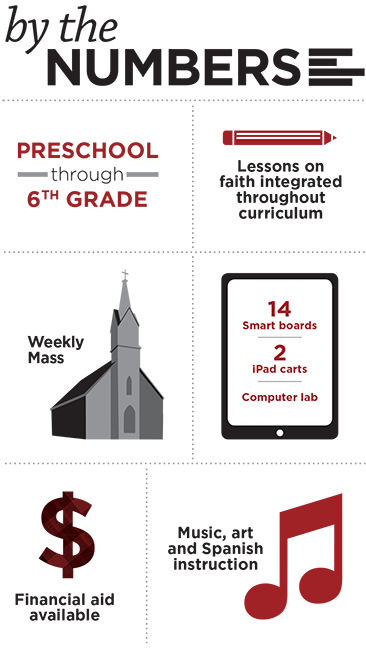 We have a fully equipped computer lab, as well as iPads and SMART Boards to enhance the educational experience. Students also engage in hands-on learning experiences in many of our subjects. Providing students with opportunities to express and grow in their faith is vital to our role as Catholic educators. With Jesus as our most important example, we start and end every day with prayer, and pray in between. Students participate in weekly Mass, reconciliation, monthly Adoration and other activities that encourage them to put their faith in action. In addition, we promote being virtuous and having strong morals; encouraging students to not only read the words, but “walk the walk” in their interactions with each other. There are many opportunities for students to explore their non-academic interests by participation in extra-curricular clubs and organizations such as book club, mileage club, Scouts, spelling bees, outreach activities and sports teams.